Often referred to as the eyes of a house, authentic-style windows play a vital role in defining the character of a period property. Key components of overall appearance, they are inextricably linked with architectural style and it is often through examining windows that you can determine the age of a building. Usually made from wood or metal, period windows are vulnerable to decay if not properly maintained and if you are renovating you might find you need to replace them. This guide will help you choose the best windows for your period home. Find out more about windows on our dedicated pages. Should I repair or replace old windows? Original windows were made using traditional techniques that are hard to imitate today due to modern building regulations, and their unnecessary replacement erodes the character of period homes. This means it’s vital that very effort is made to preserve and maintain original windows. Single-glazed windows are often replaced with double glazing due to a fear of inefficiency. But you are unlikely to ever see a return on fuel bills, while the originals could have been upgraded. However, if they are too rotten to repair, inappropriate modern designs are present, or you are extending, you need to source authentic-looking new designs. Windows are priced individually, but for the purposes of working out rough costs over large areas, these estimates are presented in metre square. How can I upgrade existing windows? Old windows inevitably face threats such as warping, rotting, sticking, chipping and corrosion. Energy is lost through windows in two ways: by heat passing through the glass and by warm air escaping though gaps in and around the frames. Occasionally, individual panes of existing windows can also be substituted for insulated glass units (IGUs). To further improve performance, look at fitting secondary glazing, which involves adding a slimline pane of aluminium-frame glass to your existing windows. It’s a cost-effective, efficient way to insulate and sound-proof windows without impacting on their character. Try a company that produces discreet bespoke designs, such as Storm. The most familiar window types in period homes are side-hung casements – wood or metal – which swing open like a door, and vertical sliding timber sashes, which consist of two frames or ‘sashes’, each with panes of glass held together by wooden glazing bars, which slide vertically in grooves and are held open by weights and pulleys concealed in a timber box frame (although early sashes were held open by pegs). Manufacturing techniques developed over the centuries to allow for larger glass sections, which were cheaper and more readily available, so early windows had small panes and later windows usually had larger panes. The glazing is as important as the frame, and imperfect original glass adds its own unique character. Stained glass panes are sometimes present. If you live in a Victorian home you are likely to have sash windows or casement windows – most likely made from timber. Mock Tudor homes were also popular in the Victorian era so leaded lights between stone mullions may be present. All Victorian windows were single-glazed so many were ripped out in post-war renovation projects and replaced with double glazing. If you are lucky enough to still have the original windows, always see if repair is an option before replacement, then upgrade with secondary glazing to improve the efficiency. The 1930s housing boom created a large stock of homes that still stand today. Bay windows are common on 1930s homes and steel was used widely as shown by the popular Crittal-style windows of this time. The Art Deco movement was in full swing so unusual shapes and ornate glasswork were commonplace in 1930s windows too. In the Victorian era, sash horns were introduced on the bottom edges of upper sashes to take the additional strain caused by the lack of glazing bars and heavy glass panes. Bay windows were hugely popular in the Victorian era. Side sliding sash windows were common in some regions, such as Yorkshire. In Tudor homes, small ‘lights’ in a leaded lattice framework – usually diamonds or rectangles – set into stone or timber openings, are authentic. Casement windows continued to be used in small, rural dwellings and in the late-18th and early-19th century. Later casements increasingly had larger panes and timber glazing bars. The Victorians often adorned the upper halves of their windows with elaborate glazing bar designs and shaped windows heads, such as Gothic arches. In the 1930s, steel Crittal-style windows were widely used. Which material is best for new windows? 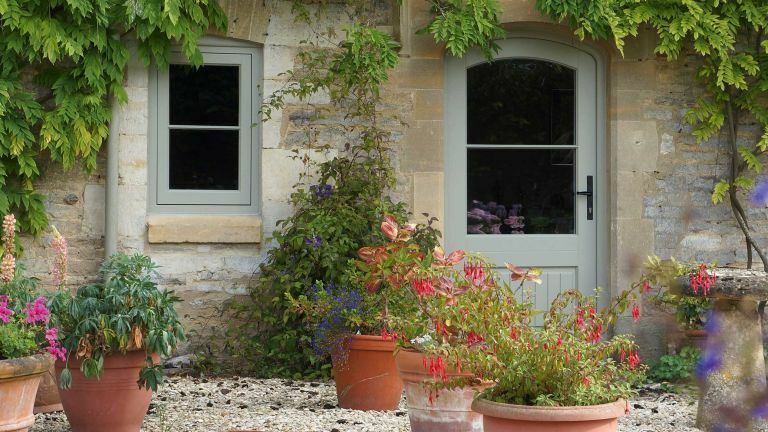 With a few exceptions, uPVC windows do little to enhance the appearance of older buildings, so ideally look to replacement wood or metal frames. ‘Timber windows offer a huge range of benefits beyond style and design flexibility, such as thermal performance and a long life,’ says Tony Pell, senior product manager at Jeld-Wen. Hardwood frames are considered the most long-lasting, although chemically improved softwood, known as Accoya, now rivals hardwood in durability. Metals, such as steel, bronze and aluminium, also offer exceptional stability and strength, and include a thermal break to produce a highly energy-efficient and often maintenance-free window. With period properties, like for like is always best. If you are looking to rectify inappropriate windows, study nearby properties from the same era to ensure the style of window matches the rest of the building. Proportion, glazing bars and the glass itself all contribute to the character and overall appearance of a window, so all components must be addressed when thinking about replacements. ‘All aesthetic aspects should be considered, including selecting the right timbers, colours and decorative options, while also taking into account neighbouring properties so your home is in-keeping with its surroundings,’ says Sean Crane, head of surveying at Jack Brunsdon. If in doubt, ask your local conservation officer for advice. Do I need planning permission to change my windows? Usually replacing period windows with like-for-like replicas will not require permission, but it may be needed where permitted development rights are restricted. If you live in a Conservation Area, planners can be very particular about the new replacements being as close to identical as possible, and if there is an Article 4 directive, you will need to apply for permission. Listed building consent is always required to replace windows in listed properties. To gain permission to replace any listed windows or doors, homeowners need to prove that the existing ones are beyond repair or that they are experiencing too much heat loss. Take advice from a reputable company that has experience in window and door design and construction, and remember that planning officers can also advise on what is and is not acceptable. Do new windows need to meet building regulations? ‘For complete new windows, the company making and installing them must be registered with FENSA,’ says Richard from The Sash Window Workshop. ‘If your current windows have trickle vents – small ventilation holes in the frame – you will need to ensure that the new windows have them or there are alternative sources of background ventilation. ‘Windows near floor level must contain safety glass (toughened or laminated) and must include the relevant safety mark clearly visible. To meet building regulations the amount of heat that can pass through the glass and framework is measured as a U-value and this has an effect on the efficiency of the window. For a listed building there is some flexibility in the U-value, in the interest of preserving traditional character. New sashes or casements fitted into existing frames are classed as refurbishment, and so this work does not require certification. Find out what you need to know about fitting new windows. There are companies that use age-old methods of manufacture using single glazing for listed properties. However, in order to comply with building regulations, most new windows are now supplied with double glazing for increased energy efficiency. This can cause issues with authenticity and elegance, as frames and glazing bars often have to be widened to accommodate them. Traditional leading also cannot be achieved with double glazing, but instead companies offer applied leaded detailing to get the look. The glazing industry is continually innovating to improve the issue, which means that double glazing units are being developed that are thinner than ever, such as Slimlite, allowing for more elegant designs. Triple glazing is another option for new windows that will enhance comfort inside. The sections will look too thick for authentic windows, but it can be a good solution for casements on some extensions, newer period-style houses and less historically important older homes. For a low-carbon, energy-efficient solution, Green Building Store’s Performance triple-glazed windows offer exceptional thermal insulation. Made from FSC redwood or oak, bespoke designs allow for period authenticity, as in these Arts and Crafts-inspired eyebrow windows. From around £270 per m². Bespoke windows or off the shelf? House renovation: how much does it cost?